This year, PBS leads the News and Documentary Emmy® Awards nominations with 41, and "In the Footsteps of Marco Polo" has been nominated for an Emmy® in the category of Outstanding Arts & Culture Programming. IN THE FOOTSTEPS OF MARCO POLO chronicles the journey of two ordinary guys – Denis Belliveau and Francis O’Donnell – as they set out to follow Polo’s historic route. 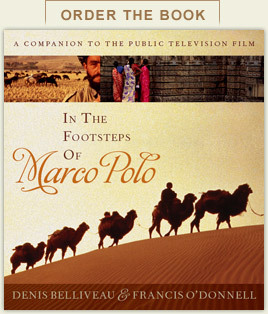 Watch the full version of "In the Footsteps of Marco Polo" now. Denis Belliveau and Francis O’Donnell took a wild idea – retrace Marco Polo’s entire 25,000-mile, land-and-sea route from Venice to China and back – and spent two incredible years of their lives making their dream a reality. View a selection of Denis Belliveau's photographs from his travels in the footsteps of Marco Polo. Denis and Francis retrace Marco Polo's travels along the Spice Route in India. From the Director’s Cut: Did Marco Polo Go to China? Denis and Francis document descriptions of China that Marco Polo did not reveal in his account of his travels. Denis and Francis find that many of the things Marco Polo described in China still exist. Watch Denis and Francis follow Marco Polo's footsteps to Balkh, the former capital of the Bactrian kingdom in modern-day Afghanistan. Watch as Denis and Francis reach the Valley of the Assassins in northern Iran, the home of a tribe of Muslim extremists until their decimation by the Mongols in the 13th century.